HOUSTON--(BUSINESS WIRE)--Houston nonprofit, Career Gear Greater Houston (Career Gear), empowers men and male youth who are striving to overcome economic disadvantage to overcome barriers and achieve self-sufficiency. Green Bank and the Federal Home Loan Bank of Dallas (FHLB Dallas) today awarded Career Gear $6,000 in Partnership Grant Program (PGP) funds to support costs for the organization’s Business Enterprise Program, helping men prepare to become construction business trade owners with a designated area of focus. In addition to offering professional attire and life skills training to Houston men, Career Gear also aims to help men gain employment and become role models for their families and communities. Through this unique grant program, FHLB Dallas member institutions contribute $500 up to $4,000 to a CBO, which FHLB Dallas matches at a 3:1 ratio to provide the CBO up to $12,000 in grant money. For 2018, FHLB Dallas has awarded $300,000 in PGP funds through 31 member institutions to assist 32 community-based organizations. Combined with the $114,010 contributed by FHLB Dallas members, a total of $414,010 has been awarded to the organizations. Since 2016, Career Gear has served more than 5,000 men and male youth in employment transition. Some notable achievements of Career Gear include helping more than 1,122 veterans transition into the workforce and offering employment support services to 1,100 unemployed fathers and 877 youth. Green Bank is a nationally chartered commercial bank and provides commercial and private banking services at full-service offices in Houston, Dallas and Austin. Our growth formula has been simple – lead in providing personalized commercial and private banking services to Texas businesses, entrepreneurs and individuals and capitalize on the vibrant and growing economies of our markets. For more information about Green Bank, visit greenbank.com. The Federal Home Loan Bank of Dallas is one of 11 district banks in the FHLBank system created by Congress in 1932. FHLB Dallas, with total assets of $75.9 billion as of June 30, 2018, is a member-owned cooperative that supports housing and community development by providing competitively priced advances and other credit products to approximately 825 members and associated institutions in Arkansas, Louisiana, Mississippi, New Mexico and Texas. Visit fhlb.com for more information. 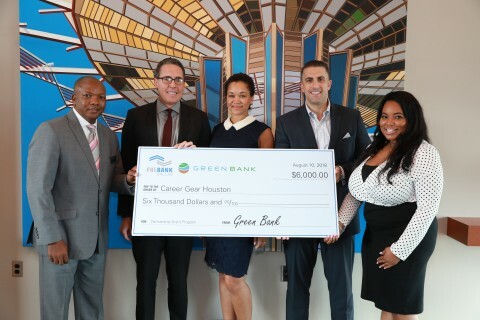 Green Bank and FHLB Dallas awarded $6K in Partnership Grant Program funds to Career Gear, aiming to empower Houston-area men and disadvantaged youth.